Have you seen Sharknado? While watching, did you find yourself thinking this film great, but it’s just way too bogged down by all of this logic and scientific accuracy? Well, have I got good news for you! The answer to your collective pleas has arrived in the form of Grizzlyshark. It has all of the irreverent lunacy of Sharknado, minus any attempt at creating in any measure a plausible scenario. This book has no delusions. It knows exactly what it is, why you are reading, and it delivers. You have your first mauling by page 2 and it never really slows down from there. Variant cover to Grizzlyshark #1. 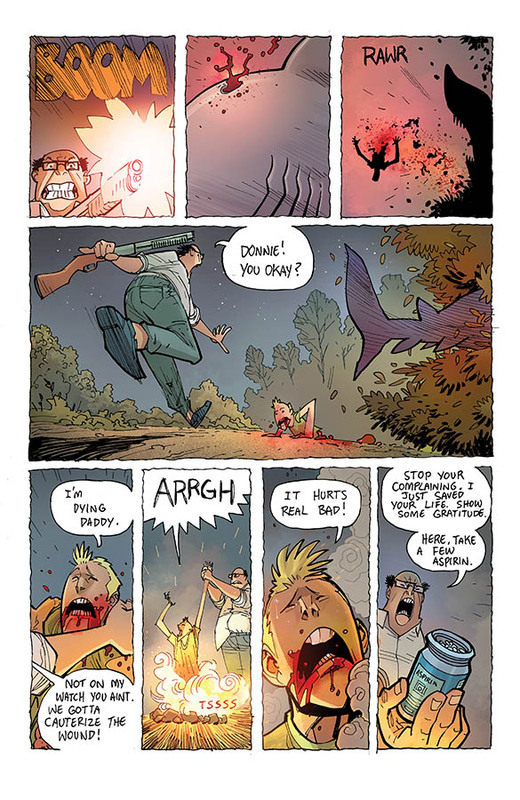 Grizzlyshark opens with Pete and Donnie, a father and son who are out in the woods camping when they encounter — yup you guessed it — a shark. We also later meet Uncle Carl, Jonbob, and Exterminator Gary, whom Pete has hired to confirm his suspicions that sharks have been eating his livestock and to get rid of them. Of course, they too meet up with Pete and Donnie and encounter, as you might imagine, a shark. The people try to survive, sharks try to eat them, and it’s all bloody fun. This book operates on the premise that sharks are land dwelling predators that live in the woods and rural areas. Notice I didn’t say mutant sharks, hybrid sharks, alien sharks, or any other possible title that could be used to explain how or why these creatures are where they are. How do they breathe? How do they move? How are they suited to this environment? Sorry, this isn’t that kind of book. It doesn’t stop to lend half a second’s thought to these queries, and neither should you. At best, this unapologetic gore-fest takes itself about as seriously as a Lloyd Kaufman movie. 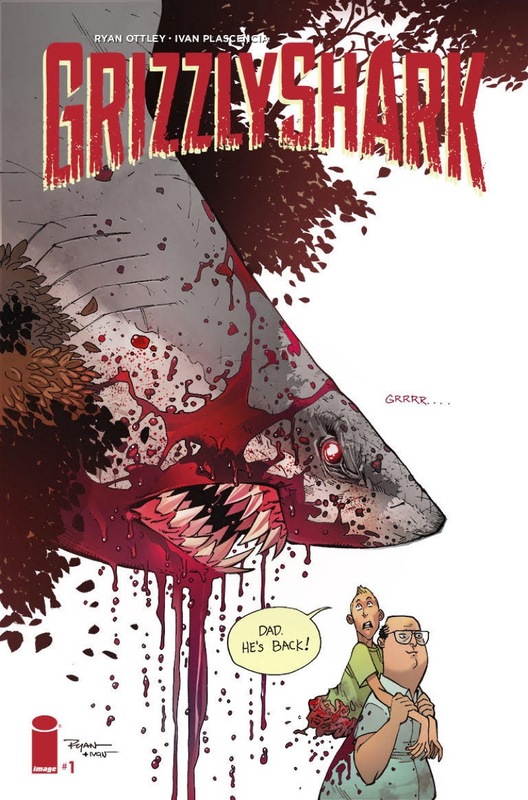 But let’s be honest, if you were browsing your local comic shop and decided to pick up a book entitled Grizzlyshark, you probably weren’t expecting something on par with The Watchmen. The creator knows exactly what the kind of person who buys something like this is hoping for, and he hits every one of those marks with a comically large mallet. Humor? Check! Ridiculous characters? Check! Tons of creature kills? Check! Everything done in total excess? Check! It’s very apparent throughout that way too much fun was had while creating this book, and it shows in the art and writing. Creator and Renaissance Man Ryan Ottley (best known for his art in Invincible) provides the words and pictures for this book, and does so with style. The art is light, a little cartoony, and exaggerated. That works perfectly for this kind of story as it emphasizes that yes he knows what he’s doing here and he’s doing it on purpose. This isn’t meant to be genuinely terrifying or taken seriously, it’s just meant to be ridiculous and fun. The writing reflects very much of that same sentiment. It doesn’t bother trying to establish much in the way of the world, or how and why the sharks are how they are. That kind of logical input would honestly just serve to bring the story down. What make this so great is the fact that is forgoes any thought about boring facts, logic, and the necessary exposition that follows in favor of jumping right into the action and only focusing on the really important things. Things like how to save a boy who has been bit in half (cauterize his torso by dunking him in the campfire duh, it works), or how to repel a hungry shark (turns out they hate the taste of a certain flavor of ice cream). Grizzlyshark is pretty much exactly what you’d expect from the title in the best possible way. It drops you right into the action, and doesn’t much let up on the throttle until the end. Writer/artist Ryan Ottley delivers a fun, over the top feeding frenzy of ludicrous proportions. The book only makes as much sense as it wants to make, and doesn’t bother with petty details or exposition. It’s remorselessly inane and gruesome at the same time. While this certainly is not a book for everyone, for those of us whose tastes it does suit, it’s JAWSOME!